Moira Gaul, M.P.H. | October 6, 2015. The Sheraton Hotel and Marina in San Diego hosted all told approximately 1,200 attendees, exhibitors, and staff participating in the conference. The annual gathering provides for a packed schedule of instructional workshops, inspirational keynote addresses, as well as powerful worship and fellowshipping time to be enjoyed with pregnancy center workers from across the U.S. and Canada. “Net Talks,” standing for news, education and truth and modeled after the popular Ted Talks, were a special feature added to this year’s gathering amid a hall of bustling exhibitors. The workshops over the four-day period addressed client services, marketing, medical topics, fatherhood and family, community and church outreach as well as development. The annual training is aimed at equipping pregnancy help centers to empower their clients as well as propel them towards what Care Net president Roland Warren called not just life, but abundant life for them and their families. Warren called upon participants to be encouraged in their “transformation model” of service to men and women facing pregnancy decisions in contrast to what he termed Planned Parenthood’s “transaction model.” Following his 11-year tenure as president of the National Fatherhood Initiative, Warren also cast Care Net’s new Vision Statement with an eye to men and fathers. Other conference keynote speakers included: founder and chairman of New Life Ministries Steve Arterburn; authors and speakers Gary Thomas and Shaunti Feldman; Chuck Colson Center for Christian Worldview Fellow John Stonestreet; and former Care Net president Melinda Delahoyde. Delahoyde, now vice president of mission advancement with LIFE International in Grand Rapids, Michigan, captivated attendees as she chronicled the inception of the Christian Action Council (CAC), the forerunner to Care Net, in 1975. Sharing of her early calling to serve, Delahoyde gave a vivid and moving account of being invited to be a founding board member by the late evangelical theologian, professor at Trinity Evangelical Theological Seminary and CAC founder, Dr. Harold O.J. Brown. Dr. Brown sounded the call that evangelicals were being urged by their Catholic brothers and sisters to join in efforts to defend and protect human life post the 1973 Roe v. Wade U.S. Supreme Court decision legalizing abortion in all 50 states. Another Christian scholar, Francis Schaeffer, was recalled as being instrumental in rallying support and shaping discourse during the early days of CAC . Schaeffer in collaboration with distinguished pediatric surgeon and subsequent U.S. Surgeon General C. Everett Koop, M.D. published a book and film series, “Whatever Happened to the Human Race?” (1979) examining the far reaching implications of chilling human rights losses following the practices of abortion, infanticide and euthanasia. The former Care Net president pointed to the continued significance of these works in 2015. Delahoyde recounted their early team receiving hundreds of letters from people around the country effectively saying, “We know abortion is wrong, but how do we help women and families in our communities?” Early goals of CAC were to provide advocacy and education to evangelicals from the nation’s capital. As newly forming groups’ objectives transitioned in the Washington landscape, Care Net emerged to effectively provide the guidance and assistance requested from communities with the hallmarks of “compassion, hope and help” – real, tangible, sustaining and life-giving help. Created and funded at the local level and drawing heavily upon community-based volunteer support, pregnancy help centers quickly sprouted and have grown to be trusted and valuable sources of information and outreach in their respective localities. Affiliates of the three national associations now number 2,500 in the U.S. alone. The concluding dinner and awards banquet was well attended and a rollicking throwback to the ‘70’s. Several affiliate directors were honored for their 20 years of service and Gary Thomas delivered a thought provoking last keynote. A novice dance troupe of four Care Net staffers entertained all in attendance with “interpretive dance,” style and comedy from the ‘70’s as well as a beautiful performance by the Eng Family handbell choir. The gathering rejoiced in the awarding of a full scholarship to Regent University to a client from North Carolina as part of the Care Net/Regent University partnership. Regent University’s Melissa Nannarone presented the award while telling the appreciative client that she was indeed a hero. 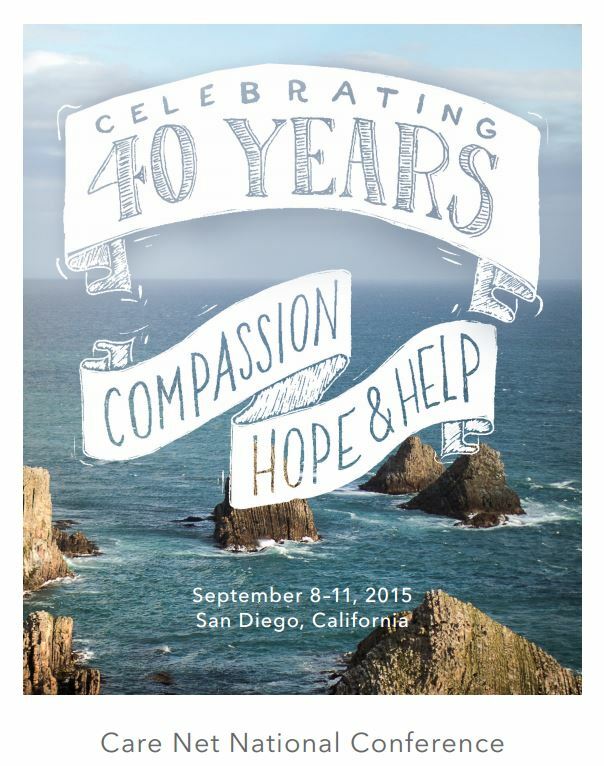 Attendees left the Pacific marina setting refreshed, equipped and reinvigorated with purpose. The Charlotte Lozier Institute distributed its recently published report, “Turning Hearts Toward Life II: New Market Research for Pregnancy Help Centers” to many affiliates in attendance at the conference to assist them in their work. CLI celebrates Care Net’s 40 years of compassionate and essential contribution to better maternal and child health as well as family well-being. We wish you all the best in your continued mission.